Monarch Brands was founded in 1947 as a rag manufacturer. Today, we process millions of pounds of new and used t-shirt, terry, and apparel material to process bulk and retail packed wipers. Since inception, Monarch Brands has grown to offer a full line of first quality towels, bar mops and restaurant supplies, as well as premium microfiber cloths, wet floor, dry floor, and now, wall washing lines. The company has recently moved to a new 300,000 sq.ft. facility to better serve you. Visit Booth 1320 to discuss your needs. Light weight extendable 'hand mop' for reaching elevated grime. Our new line of Mesh-backed side pocket mops complements our five existing canvas-backed pocket mops. A mesh backing is sewn slightly tighter and has more 'spring' than canvas material. 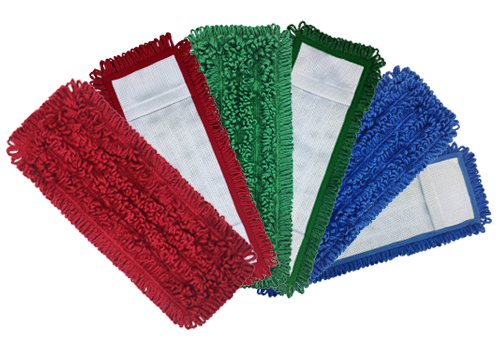 When mounted on our traditional pocket mop frame, the result is a tighter, more controllable mop head. Try Us. You'll Like Us! During the show, stop by the booth and pick up a 10%* off flyer. When you do, you will be eligible to receive 10% off your first shipment if you are a new customer, and 10%* off a new product if you are a returning customer. We process millions of pounds of new and used t-shirt, terry, and apparel material to manufacture wiping rags and cleaning rags. All textiles are cut and inspected by hand before being packaged for wholesale rag delivery. Ask us about private labeling a wiper or towel line to protect your brand. SmartChoice has proven to be better than competitor microfiber because Monarch Brands owns the entire production process. From the color pellets from which the yarn is constructed, through splitting, weaving cutting, sewing and packaging, we inspect every stage of the process. We have partnered with the largest, most respected mills in the world to bring you wholesale towels that are consistent and superior to the competition. Box after Box there will be no surprises. We focus on wholesale institutional towels, specialty towels, and restaurant linen supply. Mills make mistakes, and when they do, their customers don't want to purchase the products. Monarch Brands has deep ties with global mills and can purchase these slight imperfections for a fraction of the first quality value. We pass the savings on to you. *Exclusions apply for national bulk relationships, and sales groups.